Who should be on the paper? First law of authorship is that all authors are responsible about the content of the paper. This law has important implications whether you are the responsible author or a contributing author. If you manage the paper, it means that you must tell all co-authors that they are on the paper before submitting. If you contribute, it means you have to know what is in the paper. The latest contribution is probably the strangest for you. Well, it is for us too, but we have to play by the rules of the game. We are creative to find funding, which sometimes requires to be flexible. For example, if your promoter is not the person who sponsored your scholarship, it would be odd for the funding body not to include this person in your papers. As a first author, you are in charge managing of your paper. Since you are writing it from the start, discuss very early with your advisor and promoter (not always the same person, e.g. a post-doc may advise you on a daily basis) who should be co-author and the order of the authors on the paper. Contact the potential co-authors immediately and ask them if they agree to be part of the paper. 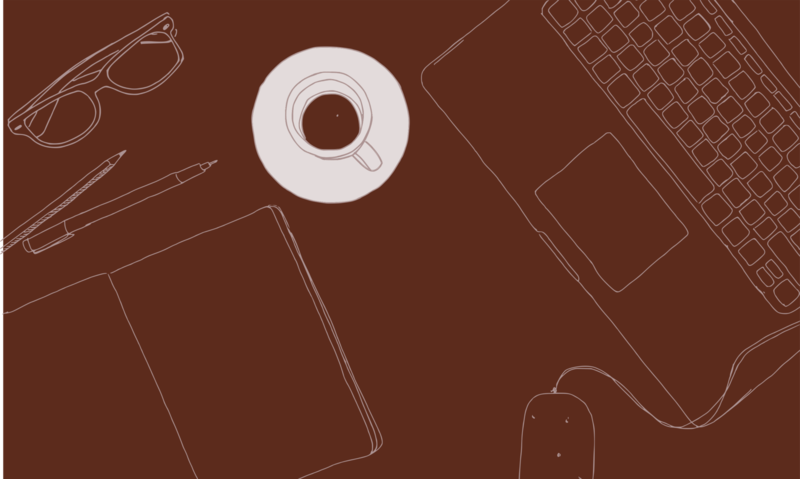 Discuss the contributions and the deadlines. You might consider not doing this if you are unsure of the paper you are writing; however, you should always do it. Of course, some draft papers may not lead to anything but in most cases, involving co-authors will create the peer pressure that is so effective in pushing you out of your comfort zone. 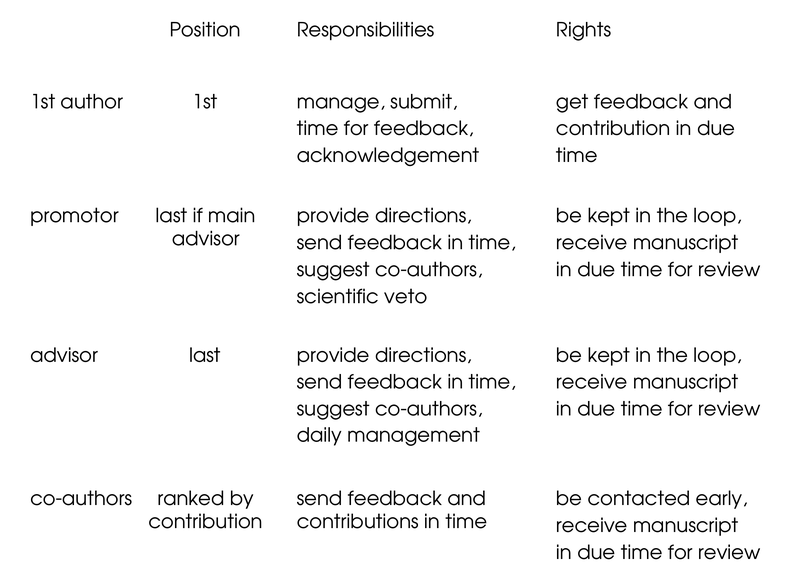 Here are the responsibilities and rights of each co-authors according to their role. Note that responsibility does not mean doing it alone but instead keeping it on the todo list. The first author is the person in charge of the paper. He/she manages the writing process and the contributions of everybody. His/her responsibility is to submit the paper. But before that, he/she must send the manuscript according to the agreed timeline to all co-authors that need to contribute to the text. He/she is also responsible for acknowledging funding and people having an indirect contribution. His/her right is to get feedback from the co-authors in due time provided he/she respected the deadline. The promoter is officially the academic responsible of your work. He/she might not be your direct advisor (see next point) but is still the guarantor of the scientific soundness. Because of that, he/she has a veto on what you want to publish. However, since he/she also trains you to become an independent researcher, you might receive autonomy for some decisions. The promoter is responsible for suggesting co-authors as he/she has a better overview of the research being done. If you were not added to a paper which you thought you belonged, your supervisor is the person to talk to. The promoter is generally placed last if he was also your main advisor for the work (see next point). If you have more than one promoter, follow the same rule. The advisor is the person who supervised you during the work. He/she is responsible for suggesting co-authors, providing suggestions and feedback in due time according to the timeline agreed upon with the first author. He/she has the right to be kept in the loop without chasing the first author. In our research groups, we want to acknowledge people’s real contribution. Therefore, he/she should be placed last even if he/she is not the promoter. Note, however, that another decision might be taken together with the promoter for specific cases, e.g. strategy of the group. The co-authors are all other contributors as defined above. They have the responsibility to contribute and provide feedback according to the timeline agreed upon. At the same time, they have the right to be informed and to receive the manuscript early enough for a review.